Hall opens the season for Georgia with a career best of 21-feet, 9.5-inches. Kate Hall of Casco has another national record in sight. At her season opener at Clemson on Saturday, the University of Georgia junior won the long jump with a career-best indoor leap of 21 feet, 9.5 inches – a distance that leads the nation. Hall believes the national indoor collegiate record of 22 feet, 8 inches is within her reach. 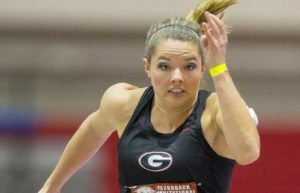 Kate Hall of Casco, a junior at the University of Georgia, is aiming to set more records this year in long jump. As a high school senior in 2015, Hall jumped 22-5 to break the national high school long jump record at the New Balance Nationals. Three months earlier, she won the New Balance National Indoor title in the long jump with a meet-record mark of 20-11.25. Hall’s jump on Saturday is tied for second on Georgia’s all-time list. She also won the 60-meter in 7.32 seconds. The Bulldogs swept the top three places in the long jump, with Olympian and national collegiate triple jump record holder Kenturah Orji taking second in 21-2, and Georgia freshman Tara Davis placing third in 21-1.25. Hall has dramatically improved her approach and landing in the long jump since last year, when she won the NCAA Division I national title in the long jump as a redshirt freshman with a mark of 22-1. A Type I diabetic with celiac disease who was home-schooled, Hall competed for Lake Region in high school. She ended up a seven-time high school All-American. Last winter as a sophomore, she earned collegiate All-American honors for the first time, finishing fourth in the long jump (21-3.25). That was largely due to Georgia Coach Petros Kyprianou changing her takeoff to allow her to push off with her entire foot rather than just her toe. It gave her more power. During the outdoor season, Hall said Kyprianou worked on her approach run, breaking it down into three phases and emphasizing the final four steps, which she said is critical to making sure she takes off on the board, as opposed to before it, as she did frequently in high school. Long jump marks are measured from the board to where the jumper lands. She said the perfect approach helps her build speed that will power a liftoff that will send her soaring. Done right, the approach starts with two to three long, powerful strides that lead into a set of faster strides that help the speed build, and finally four short, quick steps that are hammered down right before the board. This indoor season, Kyprianou and Hall worked on the last piece: her landing. It still needs work, Hall said, but it’s become clear there is more distance to be gained. She’s enjoying her event more and is excited at the prospects. All three of Hall’s final takeoff jumps on Saturday were perfect. On her second jump she landed past the 22-foot mark, but lost the distance because her long ponytail fell behind her, so the jump was measured from the board to her hair. Learning the technical aspect of a perfect long jump – and having a training partner in Orji, who is an Olympian and a national-record holder – has given Hall a lift.